Babies have a lot of little clothing items, and it's not practical (or pretty) to throw all these tiny things in a drawer. It's much easier to find what you want and enjoy your baby's beautiful wardrobe if you use some practical and lovely storage options. Now that most libraries organize their books by computer, the ubiquitous card catalog has become a thing of the past. However, those tiny drawers are just right for storing baby's clothes. Look for card catalogs at antique stores, flea markets, and estate sales. This piece will give your nursery a fun, vintage feel you won't see anywhere else, and it's a practical way to store all those little items. Use those cute little label spots on the front of each drawer to list its contents. If you can find a card catalog of the right height, you may be able to have it double as a changing table. Some card catalog drawers have open sides. If that's the case with the one you find, add strips of wood or cardboard to keep baby's clothing in place. 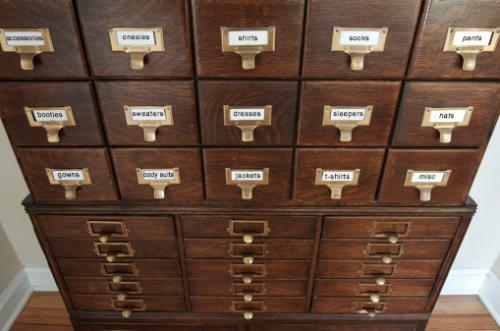 You can do the same thing with an old apothecary cabinet if you can't find a card catalog or want to try something a little different. Drawer dividers, which you can purchase at any home goods store, are a great option for any place you need to store a bunch of little things, but they really shine in the nursery. 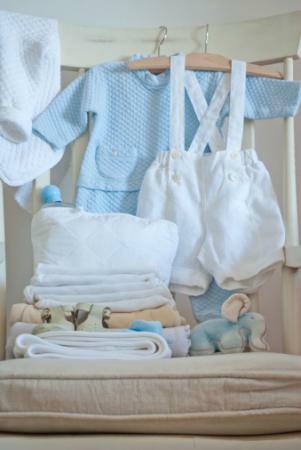 You can use them to arrange onesies, sleepers, pants, and socks, making sure everything is easy to see when you need to put together an outfit for your baby. 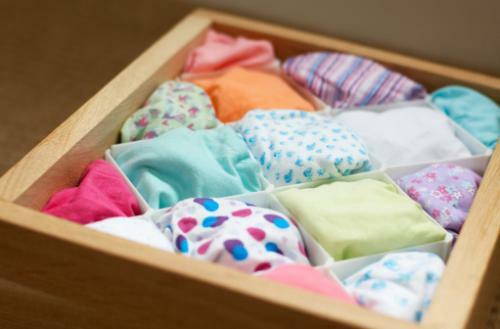 Use shallow dividers, such as those designed for adult socks and underwear, and stack them in your baby's drawers. You can fold one onesie or shirt to put in each little compartment, allowing you to see everything at a glance. Cover several cardboard shoe boxes in pretty contact paper to use as adorable (and free!) dividers. You can put onesies in one, pants in another, and sleepers in a third. Organize dividers by outfit, instead of type of clothing. You can just grab a complete look out of a box and have your baby looking great with minimal hassle. Use this for active clothing (such as swimsuits, shorts, and sweats) too. These items tend to store well folded. There's no reason to hide those adorable little dresses or suits away in a closet. You can use them as part of your nursery's decor and keep them handy at the same time. To do this, you'll need to modify a bookcase by adding hanging bars. Rather than drilling into an antique bookcase or one you plan to use again for books, you can use ordinary tension curtain rods. Just buy one rod for each shelf. They won't support a lot of weight, but baby clothes are very light. Organize the hanging shelves by type and color to make it easy to find what you need. You can even make a rainbow of dresses for some extra style. Place baskets or bins on shelves you aren't using for dresses and other hanging items. This is a great way to store things like socks and onesies. If you have some sweet sweaters, hang those too. They can take up a ton of space in drawers, and unlike grown-up sweaters, they are so light that hanging won't harm their shape. A valet stand is an old-fashioned touch that's actually very practical in a nursery. 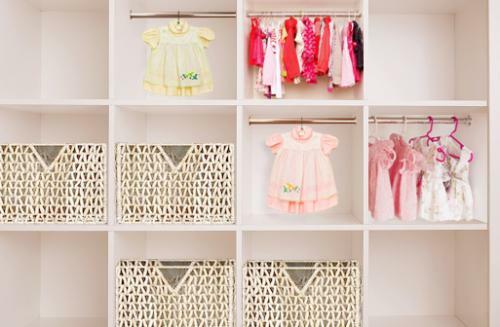 You can store and display a special outfit or lay out the next day's clothes for your little one. Vintage chairs are lovely, but they aren't always a great choice for the wear and tear of the dining room. This is a great way to give a beautiful old chair new life. You can find inexpensive vintage chairs at antique stores and flea markets. Place a few decorative boxes on the seat of the chair to store small items like hair accessories, shoes, socks, suspenders, and bow ties. Use cute hangers with hooks that can swivel. Then you can hook the dresses or outfits over the back rail of the chair and allow them to hang down. You can store several outfits this way. Watch for old paint. If your chair is painted, have the paint checked to make sure it isn't lead-based. If it is, have it repainted for your baby's safety. 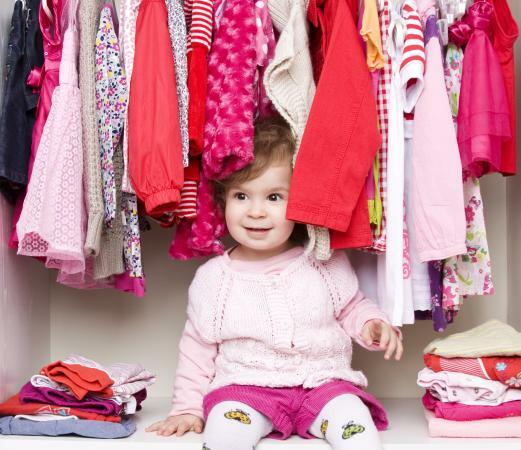 No matter which storage method you choose, the key is keeping your baby's clothing handy and visible. When you have a little one rolling around on the changing table, easy, smart clothing storage is essential.